An international collaboration to discover and develop new therapeutic drugs is set to find new treatments for Ross River Virus. 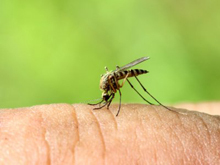 The mosquito-borne virus is widespread across Australia and the South Pacific, and is responsible for the debilitating Ross River fever that strikes about 5000 Australians each year. The collaboration involves Drug Innovation Ventures at Emory, LLC (DRIVE) and UniQuest, the commercialization company of The University of Queensland (UQ), through the Queensland Emory Drug Discovery Initiative (QEDDI). The project is the first for QEDDI, a new drug development capability established at UQ, managed by UniQuest and supported by the Queensland Government through the Advance Queensland initiative. In the collaboration, DRIVE will use its expertise in medicinal chemistry to deliver potential drug candidates to UQ for investigation using their expertise in the area of Ross River Virus for antiviral testing. The groups will then collaborate on the further development of any promising drug candidates for the treatment of Ross River Virus, with QEDDI, DRIVE and the Emory Institute for Drug Development (EIDD) contributing expertise in medicinal chemistry and UQ its expertise in Ross River Virus research. UniQuest CEO Dr Dean Moss said he was delighted to see the collaboration come to fruition. QEDDI and DRIVE were established to pursue the discovery and development of potential new disease treatments through collaboration and commercial relationships. DRIVE is a not-for-profit company wholly owned by Emory, but with the independence to run like a biotechnology company. DRIVE applies focus and industry development expertise to efficiently translate discoveries to address viruses of global concern. UniQuest is one of Australia’s leading research commercialisation companies. It specialises in global technology transfer and facilitates access for all business sectors to the world class expertise, intellectual property and facilities at The University of Queensland, Australia. UniQuest enters into over 400 research contracts per year – many repeat clients from industry. UniQuest has created over 70 companies from its intellectual property portfolio, and since 2000 UniQuest and its start-ups have raised more than $515 million to take university technologies to market. UQ technologies licensed by UniQuest – including UQ’s cervical cancer vaccine technology and image correction technology in magnetic resonance imaging machines – have resulted in combined net sales of final products in the order of $11 billion from 2007 to 2014. The Queensland Emory Drug Discovery Initiative (QEDDI) is an initiative providing access to medicinal chemistry capabilities in addition to drug discovery and development expertise. Managed by UniQuest, UQ's main commercialisation company and supported by the Queensland Government, QEDDI will oversee the development of a pipeline of new drug candidates to meet existing and future global health challenges including cancer, diabetes, inflammatory disorders and infectious diseases.